Tokyo Joe’s is excited to announce the opening of their 50th Restaurant in Wheat Ridge, Colorado located at 3753 Wadsworth Boulevard. People are actively looking for healthier food choices and Tokyo Joe’s delivers on that promise. With a diverse menu featuring Made-to-Order Sushi Rolls, Build Your Own Bowls, Signature Bowls, Salads, Poke Bowls, Bento Boxes and Kid’s Meals there is truly something for everyone. 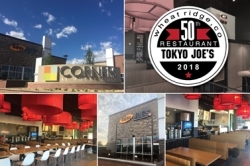 Wheat Ridge, CO, September 18, 2018 --(PR.com)-- Tokyo Joe’s is excited to announce the opening of their 50th Restaurant in Wheat Ridge, Colorado located at 3753 Wadsworth Boulevard, just North of the new Lucky’s Market. People are actively looking for healthier food choices and Tokyo Joe’s delivers on that promise. With a diverse menu featuring Made-to-Order Sushi Rolls, Build Your Own Bowls, Signature Bowls, Salads, Poke Bowls, Bento Boxes and Kid’s Meals there is truly something for everyone. “We opened the first Tokyo Joe’s 22 years ago and the desire for healthy, clean food that also tastes great is as strong today as it was then. We couldn’t be more thrilled to finally be opening a Tokyo Joe’s in Wheat Ridge. This is a vibrant and active community – exactly the kind of people we see in our restaurants,” said Mark Davis, Tokyo Joe’s CEO. To commemorate this milestone event, 100% of Sales on Tuesday, September 18th will be donated to the, MC-1 Foundation whose mission is to provide financial support for officer’s who have been injured in the line of duty. Members of Tokyo Joe’s loyalty program, the Addict Club, who visit the new Wheat Ridge restaurant throughout September and early October will be automatically registered to win a custom Tokyo Joe’s cruiser bike. The more frequently a guest visits, the more entries he or she will receive into the drawing. The winner for the bike will be drawn on Monday, October 15, 2018. The winner does not need to be present to win. Guests can sign up for the Addict Club at any Tokyo Joe’s restaurant or online at TokyoJoes.com. This is the 4th new Tokyo Joe’s Restaurant to open in 2018, and will be followed by another opening in Colorado Springs that is scheduled to open a week later. These restaurants were preceded by openings in Parker and Arvada, Colorado and Surprise, Arizona earlier this year. The Wheat Ridge restaurant will be open from 10:45AM until 9:00PM Monday thru Sunday. Headquartered in Denver, CO, Tokyo Joe’s fresh Asian kitchen is a regional fast casual restaurant. The company offers a mix of signature and made to order rice and noodle bowls as well as signature salads, poke and fresh sushi rolls. Receive exclusive offers including a free Entrée by joining the Tokyo Joe’s Addict Club at www.tokyojoes.com/addict-club. You may also follow us on Twitter @TokyoJoes, on Facebook at www.facebook.com/tokyojoes, and on Instagram @TokyoJoes. Tokyo Joe’s offers 2 for 1 Sushi Rolls and Poke Bowls every Monday night from 4:00PM until close. For more information, contact Katy McIntyre, VP of Marketing for Tokyo Joe’s at 303-564-9060 or kmcintyre@tokyojoes.com.